We're excited to partner with Kaeser & Blair to offer one (1) lucky a reader a FREE Kaeser & Blair Business Starter Kit ($85 value). In your starter kit, you'll get everything you need to launch your very own home-based promotional business. • Access to online training assets and “getting started” information. • Best Buys catalog to show potential customers. • Supplier and manufacturer catalogs with promotional products you can sell. • A large assortment of Kaeser & Blair’s best-selling product samples. Kaeser & Blair is a leader in the promotional products industry, with a history and reputation rivaled by few. If you’ve ever been given an ink pen or a coffee mug with a company logo on it, there’s a good chance that product came from Kaeser & Blair. 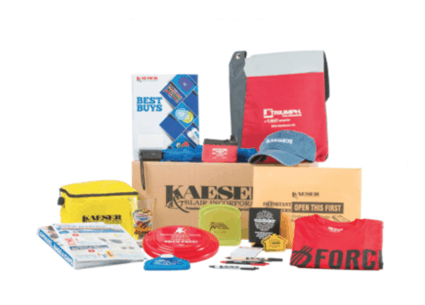 As an independent business owner for Kaeser & Blair, you can earn money selling these in-demand promotional products to companies and organizations. This opportunity is perfect for those who have a strong interest in direct sales opportunities but don’t find the idea of selling makeup, jewelry or purses particularly appealing. To find out more about the Kaeser & Blair home business opportunity — click here. This giveaway is open to US residents, 18 years or older. Please use the Rafflecopter widget below to enter, and remember to leave a comment on this blog post. Good luck! This post was sponsored by Kaeser & Blair. Please be aware we only promote advertising from companies that we feel we can legitimately recommend to our readers. See our disclosure policy for further information. I would love to use this to own my own business. Thanks for the opportunity. What a great opportunity! I was recently diagnosed with multiple sclerosis and have been searching for ways to work from home. Thanks for the giveaway! Never heard of Kaeser and Blair, but the starter kit seems like a good opportunity. I would really enjoy winning this. As a mother of an adult special needs daughter a full time job outside the house on fixed hours would no work with the schedule she has with medical tests and dr appointments. This would give me the added income and independence again working. I’m a stay home mom. I would Love to win this giveaway. It would be a dream come true to own my own business. Something I can take ownership of. I would be able to help out my family financially. Wow! This seems to be a really nice opportunity for work at home moms. I am going to pass it along with my social channels. Thanks a lot for sharing it with us.